Students come to CGP from throughout the nation, as well as the world. Each brings a different background, with diverse skills, knowledge, and experience. Examine the student gallery to see a bit of this diversity. This combination of different knowledge and experience proves crucial during group projects and class discussions. The small size of the student body and intensity of the curriculum mean that each class often becomes an extended family of sort, learning from each other both inside and outside the classroom. Students spend four semesters in Cooperstown going to school full time. The Class of 2013 enjoys the historic site of the 1969 Woodstock Festival at the Museum of Bethel Woods. 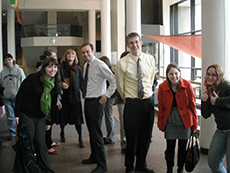 The Class of 2012 during a class trip to the Rochester Museum and Science Center. 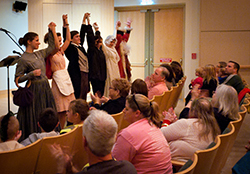 The classes of 2013 and 2014 take a bow after perfoming in "Night at Our Museum" at the Fenimore Art Museum. 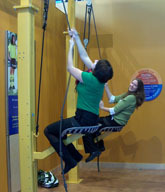 Cara Bramson and Christina Conn (both '10) test the interactives at the Boston Children's Museum.